To understand Father’s Office, think of it this way: the burger here is the meat sandwich equivalent of “The Wire.” Those who’ve experienced it tend to praise it with a religious zeal, while naysayers (mostly those who haven’t come around to giving it a shot) claim it’s overhyped. So let it be known: we are among the office burgers’ disciples. 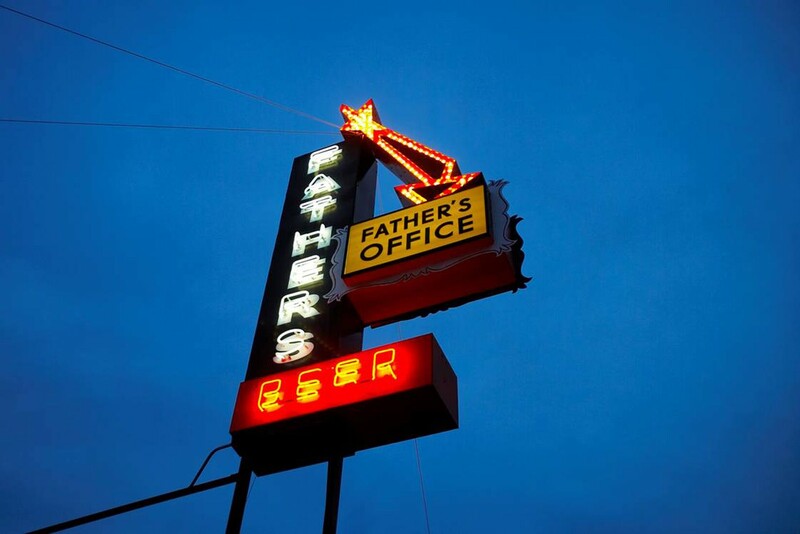 Father’s Office has been a Santa Monica fixture since 1953 and was one of the first places to popularize a gourmet burger. Not only is it the OG of the fancy burger movement, it’s also still incredibly relevant. You know how people still talk about The Wire years after it aired? Father’s Office is like that. It’s almost impossible to read a burger roundup or talk about an iconic Los Angeles dish without including the office burger. Why? It’s that f*cking good. Provided you like blue cheese and bacon, and can take the leap to eat a burger without ketchup, consider the “no substitutions” rule a favor. Every single thing on this burger contributes to making it incredible. What else do you need to know? Not much. There are other items on the menu, if you must, and we’ll tell you about them in the Food Rundown below. Also, beer. Caramelized onion, applewood bacon, gruyere, Maytag blue, arugula. As we mentioned, there are no substitutions and no additions. Trust them. Trust us. Trust no one. We don’t care. Just order this burger and do not remove anything from it. Topped with roasted garlic and cabrales cheese aioli. We don’t really know what “cabrales” cheese is and that’s okay. All we need to know is that it’s incredible. It’s important to note that the Father’s Office Santa Monica location serves only beer and wine. (Not unlike many of the other establishments on Montana Ave.) That said, they have an impressive craft beer list, including a rotating tap lineup of about 30 craft beers. Stop ordering here. If for some reason, you need to continue, keep reading. This mushroom party is guaranteed to please all attendees. The combination of garlic, thyme, vinegar and olive oil is a great way to start a meal at Father’s Office if you’re looking for something extra. Jumbo white shrimp, niman ranch bacon, scallion, cilantro-jalapeno vinaigrette. This is a smaller plate on the lighter side, with just three shrimp. It’s delicious, none-the-less. A classic bar steak served with shallot butter. Get the burger though.